You’ve described your interests as rooted in expanding the role of design and the designer in larger social and political contexts. What distinctions do you make between “design” and “activist design?” What kind of value is generated in activist design that makes it a necessary mode of practice? I think that process is key — by that I mean the process by which design is generated and created, but also thinking of the outcomes as continuous processes. Architects are accustomed to studying the physical context, but we want to expand our process to engage with the economic, political and social dynamics of the places where we work. 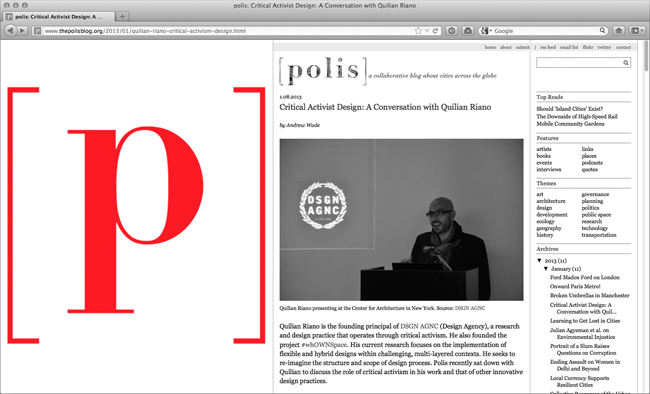 Thanks to Andrew Wade and the Polis Blog crew for this enjoyable conversation.